kidslooklikekats: Pram: "North Pole Radio Station". Pram is the Darth Vader to Stereolab's Luke Skywalker, and North Pole Radio Station is even more blatantly in opposition to the Groop's always-sunny, honey-dipped electro-grooves, in the title alone. "Omnichord" presents us with this lovely antithesis right away, containing Rosie Cuckston's ominous, crooning whisper, and plenty of evil-sounding Fisher-Price keyboards. The atmosphere and scenery have changed much since the band's nearly light hearted (in comparison) Sargasso Sea, laying the foundation for the future icy sonic structures and eerie, muzaky melodies Pram would come to embrace. "El Topo" melds a krauty beat with an Eastern-influenced melody, and "Bathysphere" loops a chimey sample around our necks for nearly three minutes. "Fallen Snow" creates a kind of Parisian bossa nova that is best described as the result if Stereolab covered The Sea and Cake's "Darkest Night". 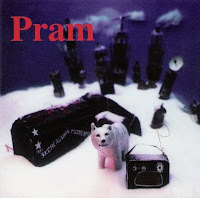 In fact, I think the reason I love Pram's sound so much is because it rings of the same jazzy, krauty, lo-fi creativity that The Sea and Cake mastered in the mid-nineties, and it's evident on this and their previous release, Sargasso Sea. Any TSAC fan will undoubtedly love Pram. The second half of the album sees a break in the clouds, and even some sunshine, in "Sleepy Sweet", and two more creepy instrumentals in "The Clockwork Lighthouse" and "Cow Ghosts". "The Doors of Empty Cupboards" finishes the album with a bittersweet mystery - "The sound of the wind, or the sound of my voice crying out?" Yes? >>Link to my original review on rateyourmusic.com.